One of the perks of being in academia is getting to travel for conferences. Last weekend I had to present a poster at the Society for Research in Child Development (SRCD) Conference in Baltimore, MD. It’s always great when my husband gets to travel with me because we love to explore new places and try to visit the local favorites. We were quite lucky for this trip because we stayed with our friends from college, Alex & Jake, and they showed us their favorite spots. We also were super excited to meet their Bernese Mountain dog, Otto, because for the past year we have only gotten Snapchats of him. Otto was a big fur ball of love! Fell’s Point is a historic district in Baltimore with lots of restaurants, bars, and shops. This area has so much charm and I am kicking myself for not taking a lot of pictures of all of the storefronts. I guess I was just having so much fun soaking it in at the time. Some of our favorite spots were in Fell’s Point (Thames Street Oyster House, Barcocina, Kooper’s Tavern, A Horse You Came In On Saloon). I can’t wait to go back so we can spend more time in Fell’s Point. “Tims”? “Tymes”? “Tames”? However you pronounce it, this was by far our favorite restaurant and for good reason. If you love oysters as much as we do and you visit Baltimore you have to check this place out! I would recommend calling ahead for a reservation because it’s a little small and gets busy really quick. We almost didn’t get a table. Thames Street Oyster House was our favorite because they had an excellent variety of oysters to choose from that came from the best places in the Northeast to get oysters. I have never been to a place that had descriptions of each oyster to give you a sense of what to expect. I’m guessing that is something that is more common in the Northeast? You also get to order oysters like you would sushi–you get to pick which ones and how many. Thames Street Oyster House was simply amazing. It’s no wonder why they have won so many awards. I must admit that the only reason we walked into Kooper’s Tavern was because it had a stained glass window of a dog on the outside. I’m glad that we walked in because it had a great vibe. Being dog lovers, we fell in love with all of the dog paintings on the walls and the fact that It was named after the owner’s dog Kooper. The doors to the bathrooms were quite funny, too (you’ll just have to see them yourself!). They had a great selection of beer and the staff was super friendly! Alex and Jake recommended Barcocina for brunch. We were the first ones there so it was pretty quiet. Also, we went on a weekday so I imagine that it gets much busier on the weekends. If you go, I recommend getting the Barcocina Guacamole. I just recently learned that I am not allergic to avocado anymore, so I have been eating so much of it lately. This guac was quite different, but certainly very tasty. It had a pasilla-lime-balsamic sauce drizzled over fresh guacamole with some shredded queso. I never would have thought that balsamic would go well with guacamole, but it had great balance and taste! We were at MaGerk’s several times while we were in Baltimore. It was close to where our friends lived, so we ended up hanging out there a lot. We had a lot of fun at MaGerk’s! We are planning to move to Philly this year, so we were intrigued by all of the Philly decor and Philly inspired menu. MaGerk’s prides itself on having the best cheesesteaks outside of Philly and I must agree! If you want the best crab cake in Baltimore, or anywhere for that matter, head to Faidley’s Seafood in Lexington Market. I must say that the surrounding area is a bit sketchy and most everyone told us that we were crazy for walking through that area. I highly suggest going during the day time and getting a ride there and back. Despite the area, going to Faidley’s Seafood is definitely worth the trip. It has been open since 1886 and has won countless awards for their crab cakes. At first I thought it was a little pricey, but once I took a bite into their crab cake I was in heaven and forgot all about the price. I have been so busy with dissertating, writing manuscripts, traveling, and life. It’s been several weeks since I have posted, not just because I have been so busy, but because I have taken some time for myself and to be with family. About a month ago my wonderful, lazy dog, Marley, went home. I felt that I needed to write a post in his memory to share his lazy legacy. I hope you enjoy this very special post and fall in love with Marley as much as we have over the years. Growing up, we had several family dogs. To some of these dogs, I was their person, which made them my dog by default. I never got to choose what kind of dog I wanted because my parents were the ones to pick out our dog. But, as a dog-loving kid, it didn’t matter what kind of dog it was, I loved them anyways. When I was in college, I decided that I wanted a dog of my own, by my own choosing. I knew for certain that I wanted an outgoing, tenacious, high-spirited yellow Labrador retriever. Instead, I got Marley. I mentioned my plans to save up money to get a puppy to my parents. A few months passed, during which I had picked out a name for my puppy-to-be and often fantasized about my plans to spoil, play fetch, road trip, and go on adventures with him once I reached my savings goal. One evening, I made my regular check-in call back home. What was intended to be a surprise when I came home for the weekend ended up getting blurted out by my excited family over the phone, “WE GOT YOU A PUPPY!” I reacted with an exuberant squeal that was cut off seconds later with, “And his name is Marley!” I was a little annoyed that I had no say in choosing his name and more-so by the fact that his name came from the movie Marley and Me. However, my vexation was quickly overshadowed by the excitement of getting the puppy I wanted. Giving him the name Marley made me expect that he would possess all of the incorrigible, rambunctious qualities and behaviors displayed by the dog from Marley and Me, on top of the general friendly, energetic, and intelligent characteristics that Labs possess. However, Marley proved these apprehensions wrong. Marley was an excellent puppy, especially for a Lab. Lab pups are known for chewing, digging, and destroying everything in sight, but not Marley. He was very calm, but most importantly, he followed the rules my mom established: do not chase the barn cats, do not poop in the yard, do not chew the siding on the house (we had several dogs who had an affinity for this), do not lie in the flower beds, and do not drag the shoes on the porch. I can’t even recall if Marley ever broke one of these rules. Perhaps it was because he thought it would be too much work to do otherwise. I knew that Labs were prone to laziness, but Marley’s laziness was legendary. There were four things that were important to Marley: being with people, food, belly rubs, and, most importantly, naps. He took the most epic naps, and nothing usually got in the way of his nap marathon. Marley’s favorite spot was on the cool bricks at the bottom of the porch stairs. Not only was this spot cool and shaded, it was a high-traffic area which guaranteed that we would either give him belly rubs or treats as we passed. If we didn’t, it didn’t bother him. I liked to wake him from his nap and put treats inches away from his nose. If it was placed too far to stretch his neck and make an effort, he would just leave it there for when he woke up from his nap. Marley would, quite literally, sleep anywhere under any circumstance. He often took naps in a kiddie pool we would fill up with water every day. He took naps in the rain. He slept through getting shots at the vet. He fell asleep with his head out the window. He even dozed off while we gave him a bath. Before we would leave for church or to run errands, we used to make bets that Marley would be in the same spot when we got home. Eventually, this became a certainty that you couldn’t bet against. Sometimes he would be in such a deep slumber that we thought he was dead. After calling his name a few times, Marley would signal that he was alive with one tail flap—he wouldn’t even pick up his head. If you wanted to love on him, you had to be willing to walk at least halfway to do so. Marley wouldn’t even get up to walk to meet you. He would literally belly crawl his way towards you and would then roll over for endless belly rubbing. We live on a farm with thousands of acres of land in the middle-of-nowhere Georgia. Most people aren’t familiar with the term or concept of a “country dog” or “farm dog”. Essentially, it’s a dog that lives on the property and has at least two jobs—to protect and to alert. Some people can’t wrap their head around this, but I can assure you our dogs were never neglected, received an abundance of attention and love, and always had a warm, dry bed in the barn. At night, our dogs and my grandparents’ dogs (who lived next door) liked to go—what we called— “rumbling” on all the land. We like to think that this ragtag group of canines, also known as “The Gang”, were protecting the land while we were sleeping by going on nightly missions. To this day we’re still not sure what they did, but we know that they were up to something because, even though they always came home in the morning, they were always wet, muddy, smelly, or a combination of the three. We attribute most of his laziness to a traumatic event he experienced when he was under a year old. One morning, I woke up and The Gang wasn’t home from their nightly venture yet, so I called for them and went back inside for breakfast. The next thing I heard was loud yelping from the yard—a sound that no pet owner would ever want to hear. When I bolted out the back door, Marley was running towards me, covered in blood. While inside, Marley came across a dog in the area known to be aggressive and have a taste for blood on his way back to the house. The dog attacked Marley and tore open his shoulder. I can honestly say that this may have been the only time that I saw that Marley was scared and heard him cry or whimper. I’m not sure if it was from the shock or from finding safety in my arms, but as soon as I sprinted to Marley, he became very composed. I wrapped him up in a towel and rushed him to the vet with him in my lap the entire way. Fortunately, no major damage was done to any ligaments, tendons, or muscles, but the bite marks were quite deep. Marley needed a lot of time to rest and heal, which was aided by lots of painkillers. After several weeks of recovery, we took Marley to get his stitches taken out and for a checkup. Within a week of getting his stitches taken out, Marley had another encounter with the vicious dog who attacked him in the same shoulder. Again, we scooped Marley up, took him to the vet, he was put back on painkillers, and was back in recovery. We’re pretty sure that all of the painkillers he was on as a puppy were the primary contributing factor to his lethargic lifestyle. This incident also affected the way that Marley ran. His form was more of a back and forth teeter-totter like that of how you would pretend to make plastic toy horse run. Marley’s legendary laziness clouded our vision of us seeing him as a normal dog. He didn’t set the bar very high for our expectations of him, but we knew he was a very good boy, sweet, and loyal. On the rare occasion, he would remind us that he was just like any other dog and physically able by surprising us with anomalous behavior (for him, at least). We learned that Marley was a master escape artist when we had to tie him up in the yard one day. I believe there was something he kept getting into, and until it was gone, we had to hold him off for safety. So, we tied him on a long rope under the barn, assuming that he would just take a nap. Minutes later, Marley was walking around the yard with about a foot of rope attached to his collar and a big grin on his face. He ended up chewing through the rope twice before we decided to detain him in a room in the barn for the time being. Several minutes later, he was walking around the yard still wearing a smirk that went from ear to ear. It turned out that Marley was more physically adept than he led on. To make the “Great Barn Escape”, Marley scaled the shelves to the top of the inside the barn, shimmied his large, barrel chest and block head through a gap less than a foot wide, and then leapt about 10 feet down from the top of the barn. Even in Marley’s attempts to demonstrate that he was just as “dog” as the rest of them, he was lazy. After a long night of rumbling with The Gang, we saw Marley proudly trotting across the field with a large object in his mouth. As he got closer, we realized he was dragging home a fawn carcass. We knew right away that this certainly was not Marley’s doing. There was no way he would have had the gumption to chase down and kill a baby deer. Whether if it was one of the other dogs that did the work or if they found it already dead, Marley took credit for it. Despite Marley’s legendary laziness, he was an exceptionally loving and loyal dog. He always wanted to be near us, always came home, wanted to keep the group together if we went on walks, and would protect us. There was one time that The Gang didn’t come home one morning. We figured that they had a “late mission” and would return shortly. A day went by and we started to worry, so we called for them. Only one dog returned—Marley. He teeter-tottered across the hay field as fast as he could, then collapsed at my feet for a belly rub. We assume that Marley came back sooner that the others because he didn’t want to be too far away from us or the food. In fact, the rest of The Gang couldn’t find their way back because they had ran so far from the property. A few of our neighbors from a couple of miles away called a couple of days later to say that the dogs were at their house and for us to come pick them up. We would regularly take family walks or jogs down a dirt road that ran perpendicular to our house. Marley always tagged along. Even when he got older, he would hobble slowly behind us even though we insisted that he just stay put. One time, I went for a quick jog and Marley trotted with me. Marley’s intention for coming along was for companionship and protection, not to keep up with the pace of the run, so we often forgot that Marley was with us until we turned around to head back. When I came to the part of the road where I usually turn around, I saw a large, unfamiliar dog several yards away. The dog then let out a growl then started running towards me. As I quickly spun around to sprint back towards the house, I was surpassed by a flash of yellow. Marley ran towards to the unfriendly dog, boldly asserted himself, and had an exchange of words. Without even physically engaging, Marley sent the other dog on his way. Marley put all of his effort into catching up with me and stayed by my side for the remainder of my run. When we got back to the house, he collapsed with exhaustion with a big smile on his face and was showered with affection. He knew he was a good boy. Marley also found time between his napping marathons to sow his oats. My grandpa was notorious for bringing dogs home without notifying my grandma. He once brought home Dixie, a full-grown, female German Shepherd who wasn’t fixed and, inevitably, became pregnant. In the weeks leading up to her giving birth, Grandpa made a whelping box under his barn for her. On a mid-December morning, I was heading to town to run a few errands. As soon as I walked out the door to leave, Marley swiftly teeter-tottered from my grandpa’s barn to me. He pitter-pattered his feet in excitement in front of me, was spinning in circles and eventually tugged my coat to follow him. He eagerly led the way to Grandpa’s barn. I heard puppy cries, but Dixie wasn’t in the whelping box. Instead, she dug under the barn and had her litter there. Meanwhile, Marley was pitter-pattering in the whelping box and whined until I came to him. Marley wasn’t concerned about Dixie and her litter, he was tending to one puppy that had been left behind in the straw in the whelping box. It was as if he were telling me, “Hey! This little guy was left behind and needs help!” I scooped the cold, nearly lifeless puppy in my arms, warmed it up, and then placed it with Dixie. Marley was such a proud father. From that litter, my mom ended up keeping a girl that we named Shadow. Stray dogs often wander up on our property. One day, a yellow dog that had Lab characteristics came to us that my husband and I ended up bringing him home with us. Given that it’s not out of the range of possibilities, we like to tell ourselves that he’s Marley’s puppy. Not only does it give us a reason to think that we have a piece of Marley with us, but it also gives Marley a bit more credit for being a ladies man. Our conversations about Marley’s laziness was always followed by, “Well, he’s been through a lot.” While the age of five is usually the prime of most dogs’ lives, Marley entered retirement at five and scaled back his rumbling and occasional antics to reserve more time for napping. Although the whites on his face really started coming through once he entered retirement, through all of college, graduate school, and getting married, I could always count on Marley to be peacefully sleeping in one of his spots and to graciously accept a plethora of belly rubs when I came home. This past year Marley turned 9 and we began to realize that we needed to give him extra attention and love because we had a feeling that he may not be with us for much longer. We joked that if he kept up his “lifestyle” he may outlive all of us. However, in early-Spring we noticed that Marley would often spontaneously throw up food. Worried, I took him to the vet to have a full workup. Marley, of course, slept with his head out of the window on the way, napped in the waiting room, and fell asleep during examinations and shots. Usually, the vets have to mildly sedate dogs to take body scans, but this clearly wasn’t necessary for ole’ Marley. The vet found that Marley had developed mega-esophagus. The cause of this is unknown, but it is essentially when the muscles in your throat don’t or stop working to pinch the food down to the stomach. As a result, the food sits in the dog’s throat and is most likely regurgitated. The only fix to this is to sit the dog upright while and after feeding. We tried doing this with Marley and he definitely kept more food down. Several months went by after his diagnosis and he seemed to be doing well. I usually go back home to visit with family a few times a month. I had been swamped with my dissertation and traveling that it had been about a month since I had been home. Nonetheless, I called home often to check in and my mom became increasingly worried about Marley in our conversations. About a month ago, I made time to go back home and check in on him. As always, he was in his spot napping and gave me the one-flap tail salute to let his presence be known. However, Marley had really declined in the past month and was having an impossible time of keeping food down. My husky, yellow Lab who was questionably overweight at times had lost so much weight. I never wanted Marley to feel that I was sad or scared, so I held back my tears and loved on him as much as I could. I ended up taking him home with me to give him intensive care and try to help Marley gain weight. We knew that if Marley didn’t show progress that we would have to make a very hard decision. While we knew that this would be a hard decision, we wanted him to keep his dignity. He was so skinny and weak that Mike and I had to carry him. I whipped him up some recommended weight-gaining meals for dogs with mega-esophagus, hand-fed, and held him up through the meals. We got through the night without him throwing up anything which made us hopeful that things would possibly look up. The next morning, he woke up, gave us a one-flap tail salute, and napped with a smile on his face. However, later that evening Marley let us know that he was ready to say goodbye. As he was fading, we cuddled him and told him that he was a good boy and that we loved him. I put my face as the end of his nose and, for a few seconds, he came to and recognized me. A little glimmer sparkled in his eye and he cracked a smile. At no point during our goodbyes was Marley scared, showed any sign of pain, or cried. He was so serene and brave which made me so proud of him. It was the most peaceful that it could have ever been. Marley closed his eyes and took his best nap on February 10, 2019. Even in his final moments, Marley was a good boy. My husband and I really don’t go crazy with Valentine’s Day. Honestly, our favorite day is the day after Valentine’s Day because we go to the stores and get all of the candy and chocolate on sale! Nonetheless, we still try to do a little something for each other for Valentine’s Day. For whatever reason, I always get so nervous and overwhelmed shopping for my husband because I want to get him the perfect gift. If you’re anything like me, hopefully this gift guide will be helpful or give you some ideas of your own! It may seem like a no-brainer, but neck ties are always a great gift for your guy! Mike has to wear suits quite a bit and he loves to dress up, so I always like to find fun but classic ties for him to wear. I love these ties from Kiel James Patrick! They’re made from silk and are sure to make your gentleman stand out! A tie case is the perfect gift to pair with a neck tie. I think it’s a great gift because it will give your guy a place to neatly keep his tie while traveling. Brooks Brothers has several options for tie cases! I suppose I always have traveling on my mind. 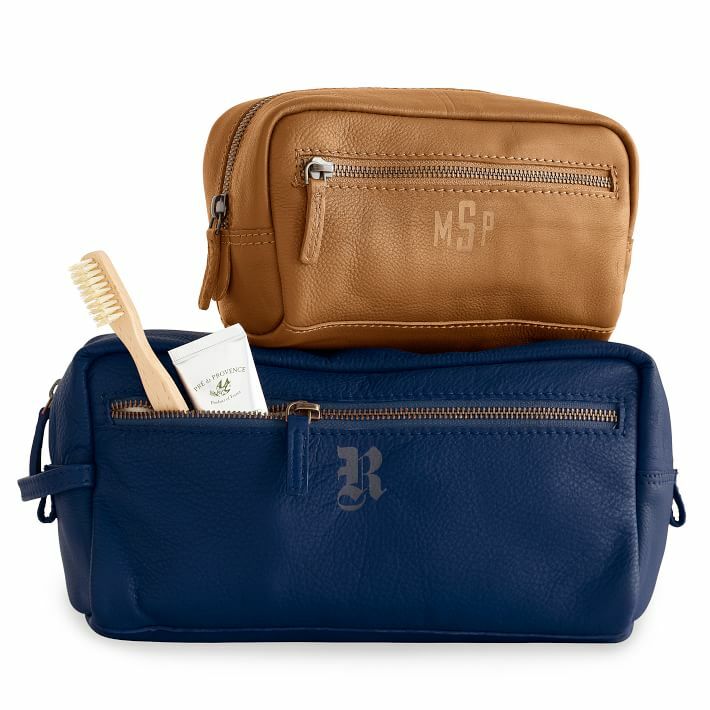 A great gift for any guy (traveling or not) is a good toiletry bag to keep all of his colognes, moisturizers, hair products, etc. Mark and Graham have a great selection of toiletry bags and travel pouches. Also, you can get them monogrammed! Another tie-related gift is a tie clip. There are actually some pretty unique and creative tie clips that will make your man stand out (and will always make him think of you!). You can find a ton of these on Etsy! A great go-to for a gift for guys is a watch. I really love the styles from MVMT. They have a lot of classic styles, but they also have a bunch of modern styles as well! Be sure to use the code THECLASSYACADEMIC for 15% off of your purchase! I hope that you find this helpful! Happy Valentine’s Day! First, we made the unfortunate decision to drive the 18.5 hours from Tallahassee, FL to Lincoln, NE. Flights were so expensive last minute and we (mistakenly) thought that driving there wouldn’t be so bad. We got off to a slow start because we had to run a few errands and drop the dogs off at boarding before we could even begin our trip. Once we were on the road, we couldn’t even make it an hour on the road before we had to stop. We went through the charming, small town of Whigham, GA and found a little café, aptly named the Whigham Café. Everyone was so friendly, and the food was great for lunch. Mike is still talking about how good the fried okra was and I, admittedly, can’t stop thinking about how I want some more of their fried pickles. With food in our bellies, we were SURE to be on our way with no more excuses. Our drive up through nearly the entire state of Alabama and across Mississippi was very long and uneventful. We thought that Memphis would be a good place to stop for the night, so we made it our goal to get there in time for the National Championship game. We wanted to go to a neat BBQ place or bar to hang out in to watch the game, but we got in too late and ended up watching the game in the hotel room. Sorry we missed you Memphis, but we hope to be back soon. The next day, we got up very early and began to drive the remaining 10 and a half hours from Memphis to Lincoln. We left Memphis with only a cup of coffee from the hotel lobby but made it all the way through the Ozarks in Arkansas, which by the way is very pretty, before we stopped for breakfast at the Ozark Café in West Plains, Missouri. This place was your typical hometown café. In fact, we were there the Rotary Club was having their monthly breakfast meeting. The coffee was hot, the food was good, and everyone was SO nice. At the time we didn’t know it, but we had officially had our first interaction with people in the Midwest. One of the best things I think we could say about the Midwest is that everyone (at least everyone we encountered) was so friendly and nice. Our next goal was to make it to Kansas City, because several people on Instagram recommended that we should stop at Jack Stack BBQ. I’m so glad that we stopped in because it was absolutely delicious. The BBQ was absolute tops and I couldn’t get enough of the cornbread. Mike ended up getting what he considers to be the most Midwestern dish you could think of—cheese corn, or as the menu called it, “Cheesy Corn Bake”. If you haven’t had or seen this before, I’m sure you’re thinking the same thing we did, that this was going to be something with corn on the cob and cheese. Instead, what was brought to us was a bowl of cheese sauce with some corn. Our waitress and the table next to us swore by it and it actually ended up tasting pretty good. Mike is still cracking up at the thought of cheese corn. Afterwards, we got back on the road and finally made it to Lincoln that late evening. Before I get into our experience in Lincoln, I should mention that we packed like fools for this trip. Mike and I are both from the Southeast, where cold to us is anything below 60. In fact, when we left, it was a glorious 70-something degrees. We quickly realized that we were underprepared for what I consider the most frigid cold I have ever been in. I’m so happy that we stopped at L.L. Bean in Kansas City to get some warm clothes. While in Lincoln, we wanted to check out the campus at University of Nebraska, the bars, and local restaurants. Our first stop was to visit the university and walk around. Did I mention that we packed like fools? After about 10 minutes of braving the cold and freezing our fingers off, we decided to get back in the truck and find a warm bar. Maybe we were being dramatic about the cold, because people on campus were wearing t-shirts, shorts, and sandals even though it was 30-ish degree weather. So began our bar-hopping. We started off downtown but realized that those bars are for undergrads and didn’t open until the afternoon. Our bartenders made a great list of bars that we needed to check out. If you are ever in Lincoln, I would recommend these places, too, so I’m going to highlight our favorites. Lead Belly in the Hay Market District: We ended up going here several times while we were in Lincoln because we liked everything about it. It has a great vibe, great selection of drinks, and super nice people working there. They serve the best cider I have ever had called Curveball Cider from James Arthur Vineyards. Also, they have the best bloody Mary I have ever had. They make their tomato mix in-house and its absolutely delicious (I may have had several). The food here is great, too. They are best known for their Raspberry Beret, but I must say I really loved their Mac and Cheese. Runza: Several people on Instagram recommended this place to us. Runza is a fast food restaurant in the area that serves local favorites. Our bartender at Lead Belly said that in schools in Nebraska, kids are commonly served chili and cinnamon rolls for lunch. These two together doesn’t sound like they would be, but I had to give it a try…and boy was I surprised. Also, you should try the beef and cabbage roll if you ever have the chance! Le Cupcake: I am always searching for the best macarons while I travel. This place popped up and they didn’t have the best macarons, but they made up for it with their amazing cupcakes. I believe this shop was featured on that show Cupcake Wars. If you have a chance, stop by for a very tasty dessert! The Oven: The entire time we were there, everyone kept recommending to us The Oven, an Indian restaurant. With our expectations high and our bellies ready for some food, we checked it out the last night we were in town. Unfortunately, the poor service we had really took away from our experience. The service was very slow, the food came out somewhat cold, and our server was very inattentive. Aside from that, the flavor of all the food was definitely there. I believe if it had been served hot and if the service was better, everything would have been great! I definitely want to give it another shot. Jack’s Bar and Grill: Great dive bar! Starlight Lounge: Best martinis I have ever had! Our last night in town a huge snow storm came through. The next day we played in the snow and took pictures before we started our 18 and a half hour drive back. The snow was so lovely and a perfect end to our trip. Driving in the snow wasn’t the most fun, but we still enjoyed seeing it. Thanks for reading about our experience driving to Lincoln! I was thinking of writing a post that reflects on 2018, but honestly It went by so fast and was such a blur. 2018 was the first year of my blog and I have had such a blast with The Classy Academic. 2019 is here now and I must say that the excitement of things to come this year has made me not want to rehash 2018. That’s not to say that the things that happened this past year weren’t important, but more-so 2019 will mark several major milestones in my life. In 2019, I will finally graduate with my Ph.D., will be turning 30 years old, and will have my first “big girl” job. Besides the getting older part, I will finally be able to say that I have accomplished the goals that I have been working so hard at attaining all of these years. I have so much to look forward to and be thankful for in 2019 and I can’t wait to see what else is in store for the new year. At the new year we always want to have our New Year’s resolutions. For me, I just want to be more in the moment and appreciate life’s opportunities more than I do already. I want to be more patient with myself, others, and life in general. I want to better demonstrate kindness to others, especially to those who have been my cheerleaders all of these years and show them how much their support has meant to me. Above all, I want to practice praying with my husband more and give thanks for our opportunities, our health, our safety, and pray to continue to have faith that everything happens for a reason. I really appreciate all of the support over this past year with The Classy Academic and I can’t wait to share more with you in 2019! Around mid- to late-semester is when projects and exams begin to pile on, and this can be very overwhelming and stressful to deal with. In this post I will talk about strategies that have been helpful for me to manage everything and not lose my head (completely). Even if you’re not in college, I think these tips can be helpful for anyone who has a lot on their plate. Whew, that’s a lot of stuff on your plate! Now, list when everything is due…. And then put those in order…. The key to managing your pipeline is to go ahead and start working on things gradually. The worst thing you can do is start on everything at once and “clog” your pipeline. So, go ahead and make an outline for that first exam. That’s your first step in your pipeline. Once you have that done, go ahead and make an outline for your paper that is due, and find the information that you will need for that. Then go back to your first exam and start studying on that. Once you feel like you’re in a good spot and have moved that down your pipeline a little bit, go ahead and start preparing for the 2nd exam. Do you understand what I doing here? It’s just gradually starting on things and moving them down the line so you aren’t focused on one thing and you are managing and preparing for future tasks. In most of my posts I talk about how planning and scheduling will help you to stay on top of your life. It always helps me to look at my planner and write down everything that needs to be accomplished that week and when. I also make a daily “to-do” list to help me keep on top of everything. For every hour that you work, be sure to schedule a 10-15 minute break to yourself to stretch, check your phone, call your mom, go on Pinterest, check your Instagram, or anything else to take things off of your mind. It is so important to take a break, but just be sure that you get back on task! When you’re in the groove of studying or working, you sometimes lose track of time. Be sure that you schedule in time to eat. This will also serve as a time to take a break and relax your brain a little bit. But it is so important that during these high-stress times that you eat healthy meals. It’s so convenient and satisfying to just eat comfort food during this time, but you should fuel your body with good food to have a sharp mind. Bring healthy snacks to the library or keep some near your desk. Along with scheduling your meals, make sure that you are getting good sleep. Be aware of how long you have been working and know when it is time to call it quits for the night. Staying up late and cramming is never a great idea. Set a time for yourself for when to stop studying or working and then get up the next day and continue. This will help you study your best and have quality work! I think this is probably the most important tip I have. Turn your phone on vibrate or silent and put it away! Try to avoid online shopping, Pinterest, or any other online habits you may have while trying to study. Find the best environment for you to do you work in (everyone is different!). I like to study and work alone from home with the TV or music on in the background, while others like to study and work together in groups in the library. Find what is best for you, but do not let things distract you! Like I said before, take a break in your schedule to allow time to be distracted by things, then get back to work! I really hope you find these tips to be helpful and that you can use some of them. I am really interested to hear what some of you do to manage your time, projects, and studies. Good luck!